Hi, I'm Kelly. I am a busy wife, business owner and mom to three amazing kiddos. We have called San Diego home since 2011 and plan to stay forever. I've seen, sensed and felt spirit ever since I can remember. I always had a knowing that my life's work would be spiritual in nature, but the exact work I would do and when did not come clearly into focus until the past few years. In 2008, I was lying on the beach when I was visited by a spirit who pointed at a woman in the distance. She told me that she was her mother and desperately wanted to tell her daughter, "Happy Birthday". I didn't know what to make of it and certainly didn't consider sharing that message for fear of sounding crazy. If I've learned one thing, it is that spirits with a message are persistent! They continued to come to me with messages in a steady stream from that moment on. A close friend, whom I confided in at the time, advised that I try to "tap in" to communicate with them to understand what they needed and how I could help. She offered to allow me to read for her. Her loved ones came through with amazing clarity and beautiful loving messages. From that moment on, I knew that I could bring healing messages through from the spirit world. I'm so grateful that my family has always been extremely supportive, even when they didn't fully understand my gift. I have been blessed also to have an aunt, Jonette Crowley, who is an internationally recognized channel, intuitive and best selling author. She has been a mentor, cheerleader and supporter throughout my life along with the rest of my family. In 2016, I attended a workshop with internationally known mediums, James Van Praagh and Lynn Probert. My inner guidance from the training I received from them and those I met there was clear that I needed to accept my gift fully and go to work for the spirit world to bring messages, healing and evidence of the afterlife to those who were open to receiving it. 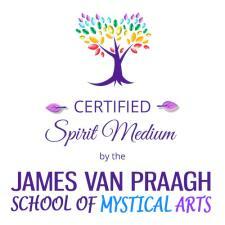 I am a certified Medium through James Van Praagh's School of Mystical Arts. A medium is always developing. In that spirit, I have found a mentor in Andy Byng who is an international medium and tutor at the famous Arthur Findlay College in England. I am also blessed to get to train under Mavis Pittilla from the Arthur Findlay College. Spirit always brings messages their loved ones need most to give them peace, hope and understanding. It is my true honor to be able to deliver these messages to bring awareness to the reality that our loved ones are still very much alive in the spirit world.